Rush Jacket - Mens is rated 4.2 out of 5 by 11. Rated 5 out of 5 by RBoutdoors from Best Shell for Skiing I admit, I love Arc'teryx products and own several jackets but none compare to the Rush for skiing. Until this year I used a Stingray jacket (I also own a Theta and a few soft shells) as my primary but it was time to change. After looking at all the options I purchased the Rush and couldn't be happier. It looks great, layers great, has wonderful pocket placement. The combination of fabrics make a much nicer feel then just a hardshell #like the SV and Theta#. If you plan to ski with a shell, this is a jacket you must look at. For reference I'm 54, 5'8" tall and 145lbs. The "M" fits just great with enough room to put an Arc'teryx layer or 2 under on cold days. Rated 5 out of 5 by Wasatcher from My Favorite Living in the Wasatch, working at one of the resorts and being outdoors most days, I've acquired a number of jackets and shells. The Rush is my favorite. It is nicely adjustable, proportionally excellent, ruggedly durable, lightweight and form fitting. I haven't found another shell with such a great combination of those factors. It may not have the pockets and add-ons some jackets do but then its simplicity is one of the things I appreciate about it. It has all the pockets and features I need for skiing and most outdoor activities. I just haven't found another brand that is so refined and embraceable. I liked it so much I was wearing it every day, so I bought a second for a different set of colors. Rated 1 out of 5 by chocho from Very disappointed I bought RUSH last year. fit is great. color is nice as well. Unfortunately ,I just used my jacket for hiking last year. In this year i could test my rush as a snow jacket in the ski resort…the perfomance of goretex was really nice…but after laundering goretex had been detached around seamed line. how could it be happened. just 1year i have used, just once my shell has been washed. i don't know how i repair it. where can i send it…terrible!! Rated 5 out of 5 by LiveIt from Great fit, function, and its comfy I have only used this jacket a few days and I am loving it. I have the Supernova color, which I believe looks a lot better in person. The hood fits perfectly over my helmet and is very adjustable. The fit looks great and feels even better. I love how light the jacket is too, feels weightless and very flexible. Powder skirt is unnoticeable, but has not zipper, or snaps for pants, could pose a problem on deep powder days, but has yet to be tested by me. Overall this jacket has been perfect! Rated 5 out of 5 by hksp1 from Best all round, multi-purpose ARC shell. To start i am 174cm，65kg，medium built with a 93cm chest measurement and a 34" waist. I normally wear a SMALL on most Arcteryx jackets but i went for a Medium on the 2013 model Rush. From other reviews i noticed lots of positive feedbacks regarding to the ski functionality so i would like to point out some feedbacks on this jacket apart from using it for skiing. Sizing. Arcteryx claims that the Rush has their Expedition Fit same as the Alpha SV. I own an Alpha personally and i can tell the Rush has a slimmer cut on the chest and the sleeves, more like Arc's Athletic Fit. It fits like a Theta AR or a Beta AR in my opinion. And this is also the reason why i went one size up. Dont get me wrong，i am fine with both the Small and Medium but i was planning to wear some heavy layers underneath the Rush so i settled for the Medium. Fabric. I love the idea of combining 2 different Gore Tex Pro fabrics with the N80P-X on high abrasion areas. This eventually helps the jacket to be more user-friendly and super comfortable to wear. It also feels softer comparing to the full N80P-X Alpha SV. Hood. Adjustments. Typical helmet compatible Storm Hood. A couple of adjustments at the back and 2 drawcords on the front, which is located outside the jacket, which can be easily adjusted even with your gloves on. I am not a fan of the drawcords located inside of the jacket near your chin just like the Modon Jacket so no problems with the hood here. Hem adjustment is single-handed operated, typical Arcteryx stuff with a non-detachable powder skirt. Pockets. Zippers. A tiny pocket on the sleeve for your passes but i do not use it too often. A couple of handwarmer pockets. They above mentioned are equipped with Watertight zippers. Meanwhile the main zipper is Watertight Vislon, which i always prefer over the normal Watertight main zipper just like the one on the Stingray. The Vislon just zips like butter and i can definitely operate it with a single hand. 1 mesh pocket and 1 zippered pocket on the inside of the jacket and it feels great to always have a mesh pocket for your sunglasses or goggles. It is also more practical when you are wearing your gloves. Verdict. I use the Rush everyday from skiing to walk my dogs or even riding my scooter to work. As one of the reviewers say it does not make sense to compare the Rush to the Alpha SV since they are built for different purposes. However i can definitely say the Rush can also be used as an everyday jacket because of the more user friendly fabric combo, the pocket configuration and the cut. Thanks Arcteryx for building the Rush. Rated 5 out of 5 by Blnclpn from Perfect fit! I was hesitating between the Rush and the Theta SV as my new skiing and 4 seasons backpacking jacket... After several shopping sessions where I have tried both jackets with multiple number combinations (and various types) of layers, I decided to go with the Rush. I'm 6'4" (185 lb.) and the fit of the Large is perfect, with just enough room to accomodate a base layer + fleece + Atom LT hoody combo. (The Theta SV had a bit too much unnecessary room around the shoulders). I've tried every other brand of Pro Shell out there (Peak Performance, Mountain Hardwear DryQ Elite & North Face... And nothings compares to the fit and build quality that I've found in the Arc'teryx Rush jacket! I'm so ecstatic about my new purchase and can't wait to enjoy the Rush for the many years to come! Rated 4 out of 5 by laflijj from TAKE A SERIOUS LOOK AT THE ALPHA SV Great jacket, but there are a couple reasons to seriously consider switching to the Alpha SV, as I did. The main reason being the increased durability of the Alpha while weighing less. The pocket location on the Alpha is more suited to wearing a pack or accessing in general, never needed the "hand warmer" pockets of the rush. Also the powder skirt is not necessary for me as I usually wear a 1/2 bib, if I really need to keep it out the Alpha has a hem cinch and a waist cinch. The stash pocket for goggles was nice when walking from the car but anything more than that and I put them in my pack or in my thigh pocket anyway since that location is a bit awkward. Also the Alpha SV allows a little more more head movement when wearing a helmet and everything is cinched tight. Rated 5 out of 5 by Marcel from Almost perfect! Needs a chest pocket! This is a great jacket! The mix 80D/40D gives you durability and save some weight without compromising features! I'm 5'5" / 147 and the small fits great! I agree with some of the reviews that say the jacket is a little on the short length side, but that's where the powder skirt is going to help you and the slide&lock feature works great to attach to your pants if you don't like to wear bibs, it provides enough room for layering and and I can move without any restriction! The quality and detail in this piece is outstanding, the blue nile color is pretty much like shown in the picture. Pockets: the two hand warmer pockets are a little higher than normal, but not totally pack friendly, they can work with a pack, but are not the easiest ones to use with a pack, the internal stash pockets is handy and the zippered internal pocket is a nice addition for some snacks or wallet, no media pocket but I prefer to put iPod on my mid layer to keep it warm and save battery. I wish there was a big chest pocket, something like the one on the Theta SVX, maybe not necessary to be too big, but a chest pocket would be a nice improvement! The hood is big and easy to go over my medium smith helmet, the collar is high but not the most spacious. Sometimes I wish there was a little more space in the collar area since it can get a little tight sometimes, but not to the point to bother me. 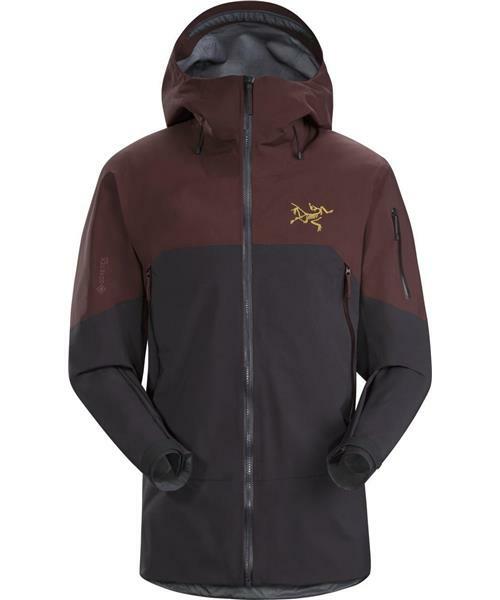 This is a great jacket, light, generous fit for layers, nice helmet compatible hood and I believe it's the least expensive Goretex Pro Shell from Arcteryx, what else can we ask for? Humm, maybe a chest pocket!